Each year, the Patricelli Center for Social Entrepreneurship awards three $5,000 seed grants to fund the launch or early-stage growth of a project, program, or venture. Walking Elephants Home, run by Becca Winkler ’16, was one of last year’s winners. This is Becca’s third report since receiving funding from the PCSE in March 2016. You can read her other reports here and here. Walking Elephants Home is a unique safari style tourism initiative in Thailand offering the opportunity for visitors to spend time with a Karen hill tribe community and their elephants who live in their natural environment. Around 3000 elephants live in captive environments in Thailand, used primarily for interactive circus style tourism. 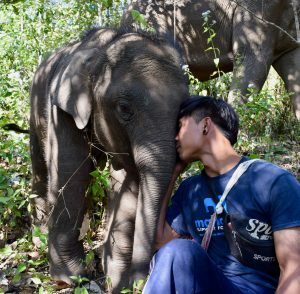 We offer a unique chance to see elephants on their terms, and created a model that empowers local mahouts (elephant keepers) who want to help their elephants and community. Winning the PCSE seed grant brought project manager Becca Winkler ’16 to the project site full time and allowed us to welcome tourists full time. Since we opened our doors to visitors this summer we’ve welcomed families with children, honeymooners, and solo travelers, even a few Wes Alums! natural habitat in natal groups, and we are looking forward to the important research that will take place at the project. Mahouts Elephant Foundation founder Sarah Blaine was invited to speak at the 2016 Animals in Tourism Conference where she was able to raise awareness among industry professionals about the plight of elephants and mahouts in the tourism industry and present our alternative. Explore Travel has generously offered to fund a booth for the project at the two largest tourism trade shows in the world in January and February. Sarah will also be speaking about The Walking with Elephants project at the first ever Vietnam Elephant Management Workshop to share our unique model for elephant centric tourism. Becca Winkler’16 and Dr. Liv Baker will be attending the conference and participating in the Asian Elephant Welfare Assessment Session. Our immediate goals continue to be in bringing more guests to the project to reach complete financial sustainability. We’ve been getting the word out on social media and guest blogs as well as investing in digital marketing. We’ve created corporate sponsorship packages for individual elephants or the whole herd and are pursuing companies that may be interested in supporting the elephants. 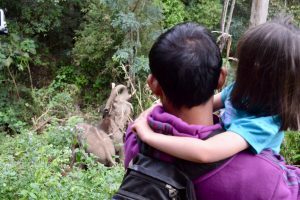 These packages are great for companies that have a corporate social responsibility component and are great PR for companies offering a free trip to visit the elephants here in Thailand. In the near future we are focused on grant applications to expand the Walking With Elephants herd and the project’s ability to host more guests. 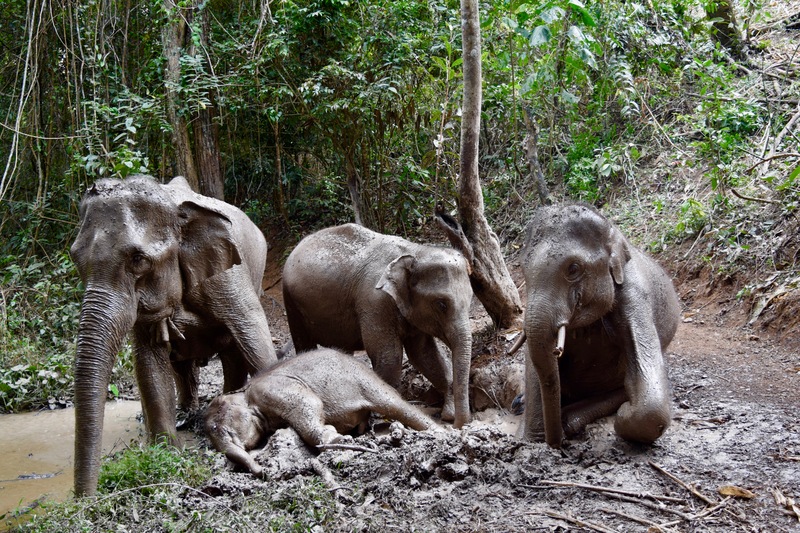 We hope to facilitate as much research into Asian elephant welfare, behavior, and conservation, and Karen elephant care as possible but are in need of grant funding to make this happen. Our most expensive trip cost is hiring private drivers to transport guests to and from the project and we are hoping to invest in a vehicle so that we can reduce trip prices and appeal to a broader market. 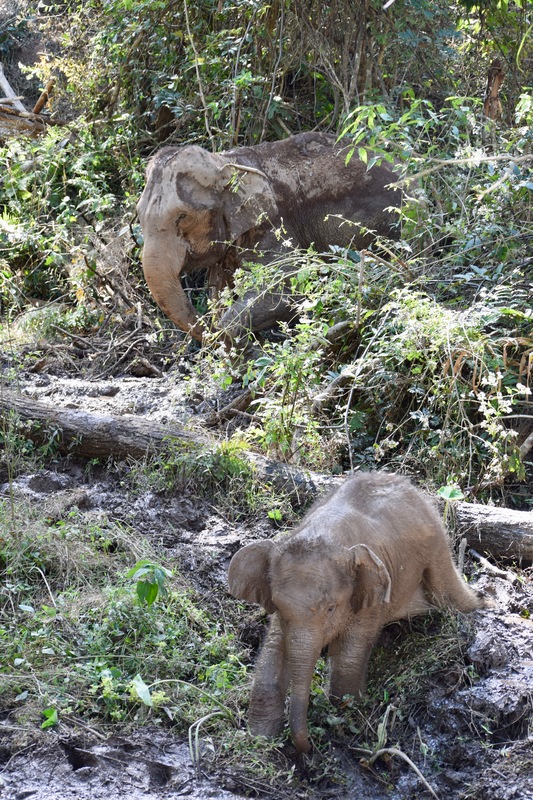 Our four elephants, Thong Kam, Bai Fern, Mario, and Sunti are thriving out in the forest. Sunti has just had his first birthday marking an entire year of freedom. 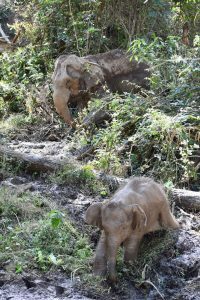 Bai Fern has grown immensely since we first met her as a vivacious young three-year-old, she’s becoming quite maternal towards her younger brother, and incredibly relaxed in her forest home. Mario continues to be a quirky young bull, always providing us with a laugh when we watch his goofy mannerisms. 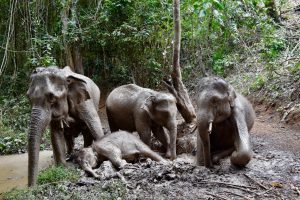 Lastly, Thong Kam our Matriarch is as awe inspiring as ever, confidently leading the youngsters to fresh food and water. All of our mahouts continue to foster loving relationships with our elephants and take immense pride in their work. We would like to thank the Patricelli Center for awarding us the seed grant and all of the support we continue to receive. 2016 has been an incredible year of growth for our project and we look forward to more amazing progress in 2017.